The Shingle mill currently at the Ledyard mill. 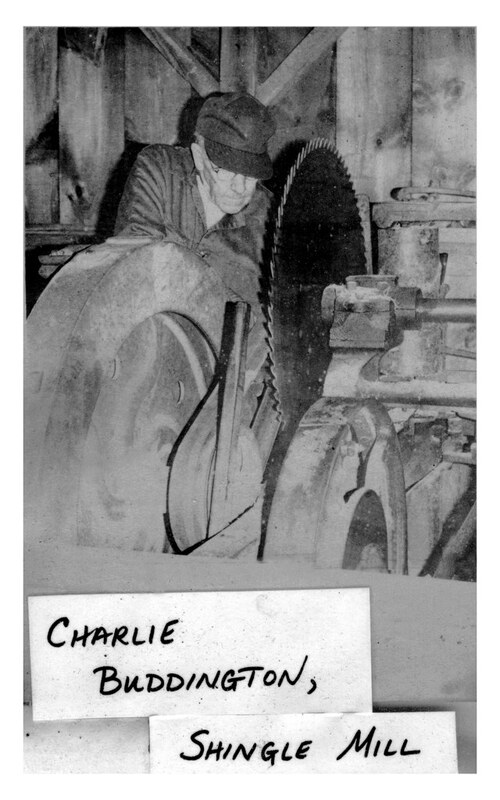 In the 1970s, a shingle mill made by Lane Manufacturing Co., Montpelier, VT was donated to the Ledyard mill by volunteer A. Palmer Steffenson. The Lane was operated with water-power for the first few years in the Ledyard mill, but in the late 1970s the power system was converted to be run off a gasoline engine. The gas engine was moved out of the building in 2014 and the shingle mill is planned to be configured to run off an electric motor. Shingle mills at the Ledyard mill 1840s-1915. 1845-1857. Ledyard tax records (Historical Room, Ledyard Bill Library) show that Albert Brown was taxed for a shingle mill for at least part of this period. The 1848 tax rolls specifically indicates “shingle mill”; for the remainder of this period the type of mill is unspecified. In 1858 Albert was taxed for only one mill which is specified as a grain mill. The mortgage was for the farm property and “also standing on the premises a sawmill and shingle mill with buzz saw and gearing belonging thereto”. It is not known whether the shingle mill listed in the 1887 mortgage was the same as listed in Albert Brown’s earlier tax records. However, almost 30 years later a shingle mill from the Ledyard mill was sold to William Welles of Mystic—it seems unlikely that an 1848-era shingle mill would still be used in 1915. 1890. $500 mortgage from Lucius Brown to Israel Brown (October 10, 1890) used similar language as the 1887 mortgage for the mill; it included a “saw mill, shingle mill, buzz saw & gearing, water privileges” (Ledyard Land Records 5, 697). 1902. In 1902 Horace H. Main (1859-1935) received from his father William Leeds Main’s estate “All interest etc acquired by foreclosure of the mortgage of Israel W Brown to said WL Main dated the 3rd day of March 1887…65 acres with dwelling house and other buildings thereon including sawmill and shingle mill” (Ledyard Land Records 9, 225). 1914-1915. Edward Welles recalled that Horace Main sold the shingle mill that had been part of the equipment in the mill to his grandfather William P. Welles of Mystic about 1914. It is not clear in Welles’ Reminiscences which specific year that Horace Main sold the shingle mill, but it seems to be when Welles was a young teenager in 1914 or 1915. 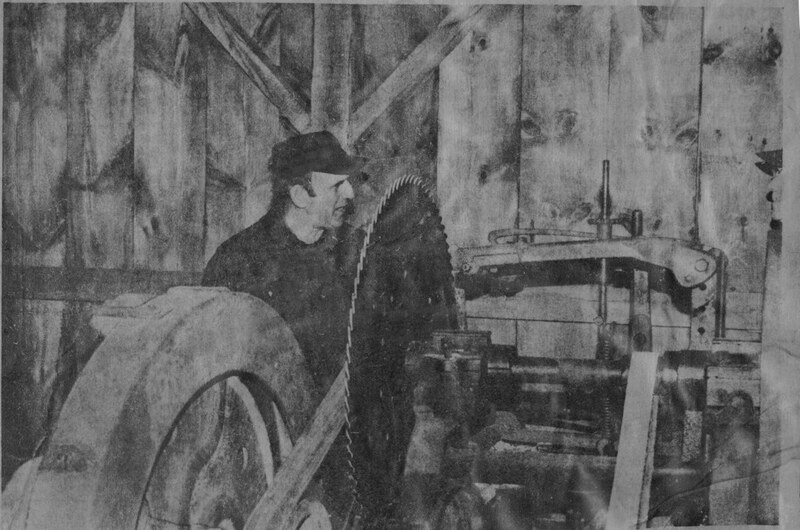 In any case, the shingle mill purchased from Horace Main was only in use in Welles’ mill for few years. The Welles sawmill was destroyed by fire on December 21, 1916. (New London Day, Dec 21, 1916, p 12.) The Lane shingle mill currently in the Ledyard Up-Down Sawmill building was donated when the building was restored in the 1970s. Welles, Edward R. Recollections of a small-town Yankee mechanic. Groton, Connecticut: Groton Public Library and Information Center, 1987. Information on shingle mill on p. 15. See restored Lane shingle mills in action at the following web sites. Neither is the shingle mill at the Ledyard Sawmill. The video below is from Jason Weir in Chichester, NH showing an antique Lane shingle mill being powered by a modern tractor power take-off to make pine shingles.